Been playing just around the one year mark. I have been trying to work on mostly bowing, straighter draw, more wrist, less shoulder and postion shifting with proper intonation. There is a lot to this Violin thing! Let me know what you think, I am no fiddlerman!!! I love how he plays this song. Dark Waltz is also in the works. Can't watch it,,, says, "This Video is Private" sorry about that. See if you can fix it please. If you switch it from "private" to "unlisted" then only people who you share the link with will be able to see it. It will still be hidden on your youtube page, if that is what you wanted to do. Oh i didn't know that, I don't post much of anything to youtube. I also don't know how to attach the video link so it shows in the window. Well thank you, on both counts! yeah that is pretty easy. Great job..... Nice use of your right arm and wrist, nice use of your left hand and your posture is excellent, + I like your vibrato. Does anything stand out that I should focus more attention to? One thing I know, is my hold on the chin rest is a little tight and needs to be worked on. It is difficult to find a good ballance point to keep tension away from your left hand and keep hold of the violin. Keep up the good work makinnoise. Yeah another badge! The feed back is great. Thats how we get better. I would say that I am self taught. I taught myself to play and read music at the same time. However I have taken one 30min lesson after 3 months of playing, Just to get an opinion of how my posture and technique was. He gave me a few tips but nothing i didn't really already know and was working on, so didn't continue. 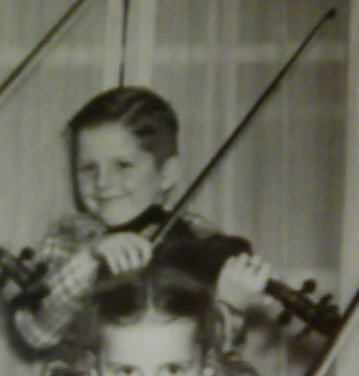 This piece I found on this site of fiddler man playing it, there is also sheet music. However he plays it different, by playing bars 9 and on in second or third position. I just stuck with first for this part.